Hey there!! I’m baaaack! I haven’t been blogging as much lately as I would like to, but the end of the school year has me running like crazy 😜. Now that summers here my plan is to chill out, relax and plan some amazing blog post for you. Most all of my blog post that I have planned for the month of June are outfits all under $100. Say whaaat? Yes, under $100…some under $50!! I love to bargain shop. A great classy look does not have to be expensive!! It’s all in how you wear it, and how you feel in it. Don’t get me wrong, I love a designer line just like anyone else, but let’s face it does don’t always fit into my budget. The look I have paired for you today is a great look for the office. 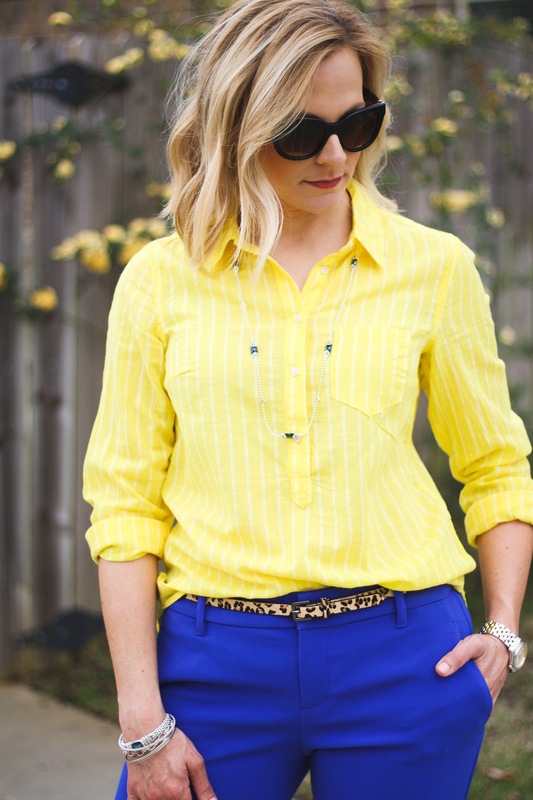 I love the simple but bright colors of this outfit, and of course pair the solids with an animal print (leopard my favorite of course)…and BAM! You have yourself a stylish look worthy of any office. Another thing I love about all of these pieces is that they are versatile. You are not restricted with any of these pieces. Pair the top with a pair of jeans or denim cut off’s and cute sandals for a summer outing. Or pair the capris with a camisole and blazer, or a T-shirt. The belt needs no explanation really LOL leopard goes with everything! This entire look (excluding jewelry) top, belt, pants and shoes all right at under $100. Although my jewelry is not under $100 it is amazing and just flat out fabulous! If you’re looking for a splurge, Lagos is worth the money…go visit the “Crockstars” at Crockers jewelers and let them help you! Best face wash for Acne.